Tori is a 26-year-old, three-time animal mom DIYer living in Northern Atlanta with her boyfriend. When I moved into my townhome apartment two years ago, we needed furniture - desparately. Luckily, I found a beautiful burnt orange corduroy couch and chaise lounge set that I loved and matched the colors I wanted in the living room. That set came with a gorgeous coffee table, and I got all of it for only $120! 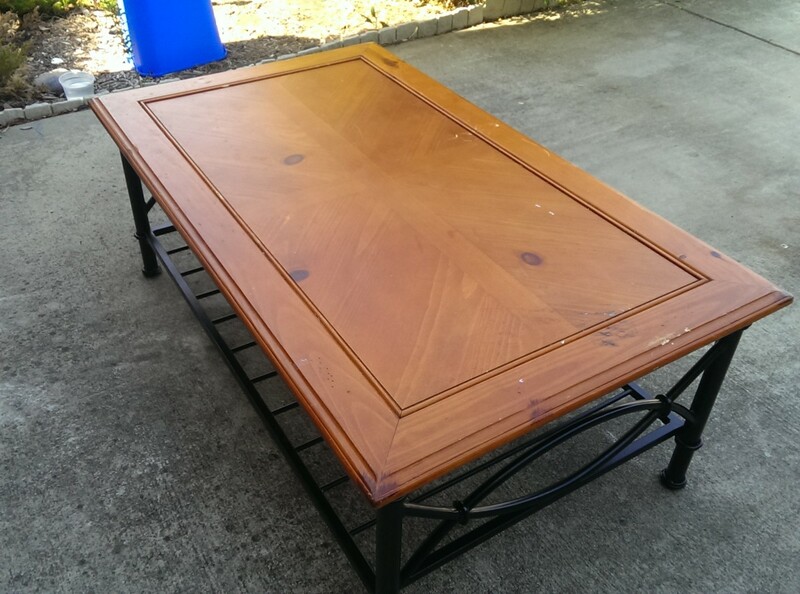 It has gorgeous burnt orange finish, and black wrought iron legs with a storage area underneath the table. They matched so well and I really loved the colors! But, after two years of kitties, spills, and general wear and tear, it has now come the time to redo EVERYTHING. Now that I'm about to move into a new place, I'm especially motivated to do these projects. My first victim is the coffee table. 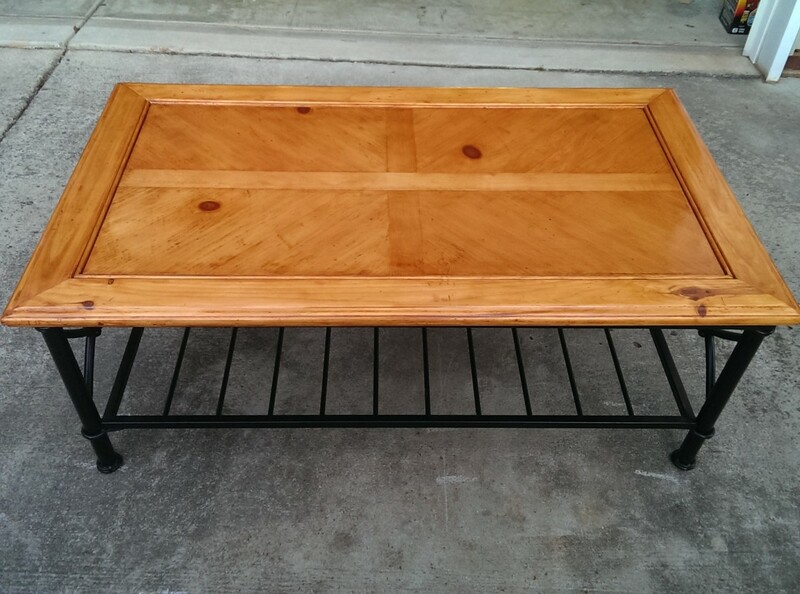 The coffee table is one of the highlights of my living room, but with all of the nail polish remover spills, stains and scratches from the previous owner, and general wear and tear I decided it was time for a new finish and a new look. But I'd never refinished anything before! I knew nothing about sandpaper or wood grains, or types of stains or what kind of supplies I needed. For about a month before I started the project, I had to do research online on several websites to compile all of the information I would need to do it and do it right. I became a little frustrated because I wanted to be able to just go to one place to get the information I needed to be able to do a perfect job. 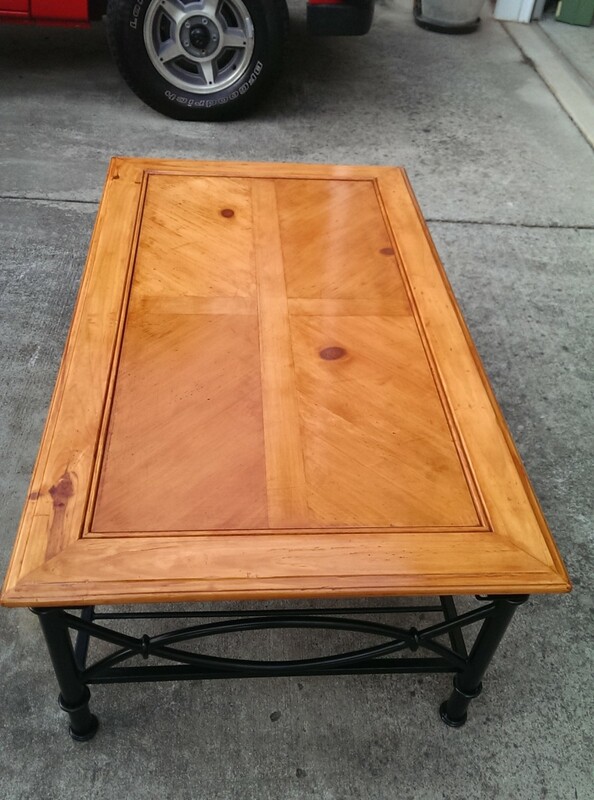 After all - I really love this coffee table and didn't want to mess it up. I thought, If I'm having this frustration, maybe there are others who are having the same frustration. 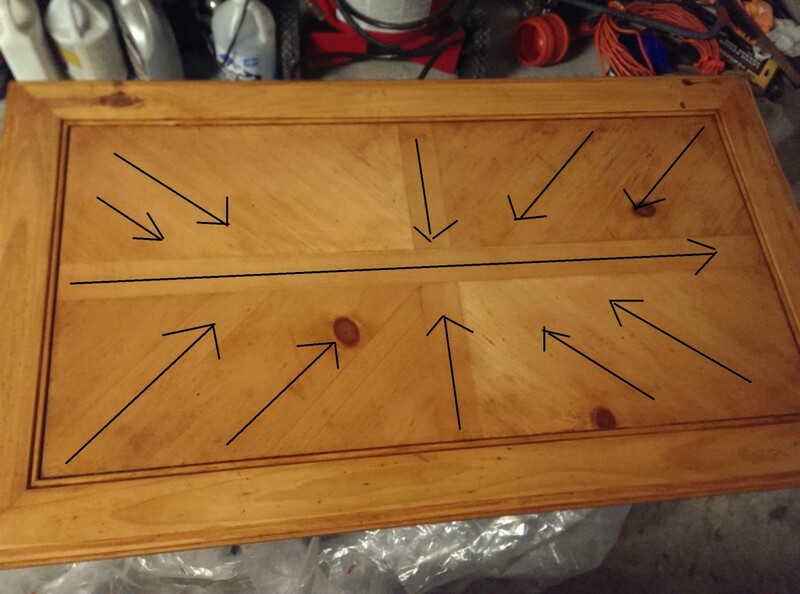 And at that moment I knew I wanted to write everything down so that I could refer back to it and others could use it too in order to complete their own wood staining projects. At first, the project really intimidated me because all the websites I went to made it seem so complicated. But after I compiled all of my research and started actually working on the project, I realized it's not as hard as it seems! It just takes time and lots of patience. As I was doing this project, I wrote everything down so I wouldn't forget anything when relaying the information for this article including the types of products I used (because that can be intimidating too). So, without further ado, here is The Complete Guide To Refinishing A Table or Coffee Table (Especially If You're a Beginner)! 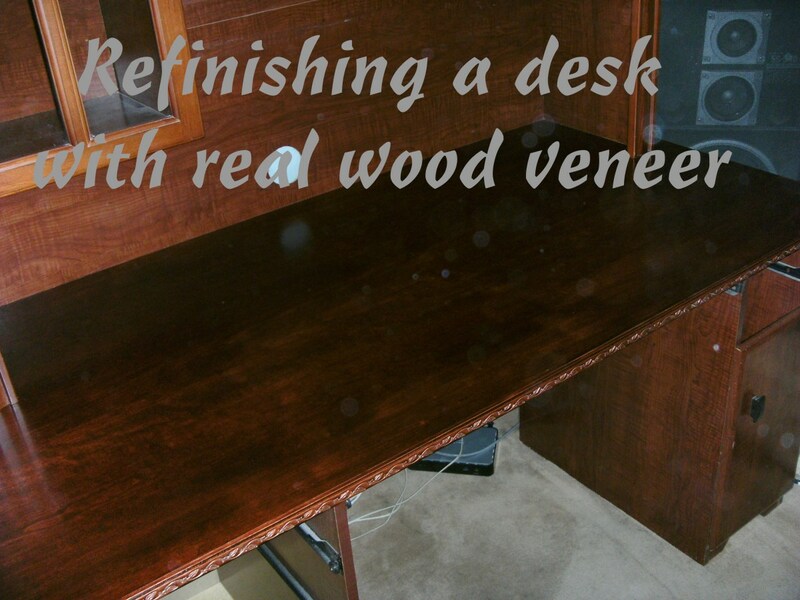 Have you ever restained any kind of furniture before? This is definitely not a "finish in one weekend" type of project. Make sure you have the time and are committed to doing it. Make sure you are wearing long pants, shoes that cover your feet, and have long gloves to cover your arms and protect from splashes and chemicals. Try to have all of your supplies at the same time (I had to run to Home Depot several times because I didn't have all of the supplies I needed, and ended up wasting time). Doing this project outside is fine if you need to, such as on a patio, but you can't do it when it's raining or humid outside because the humidity and the rain will affect the way the wood takes the stain (expanding, contracting, all that jazz). If this is where you are doing this you must wait until the humidity and rain is gone before you can start back up again. It is best to do this in a well ventilated place (the fumes will get you) that is somewhat temperature controlled and protected from the weather (so you can still do the project when it's raining). I've recommended specific products that I used for my project and they work great. But keep in mind that all furniture is different, and the brand I used may not have the color you want. 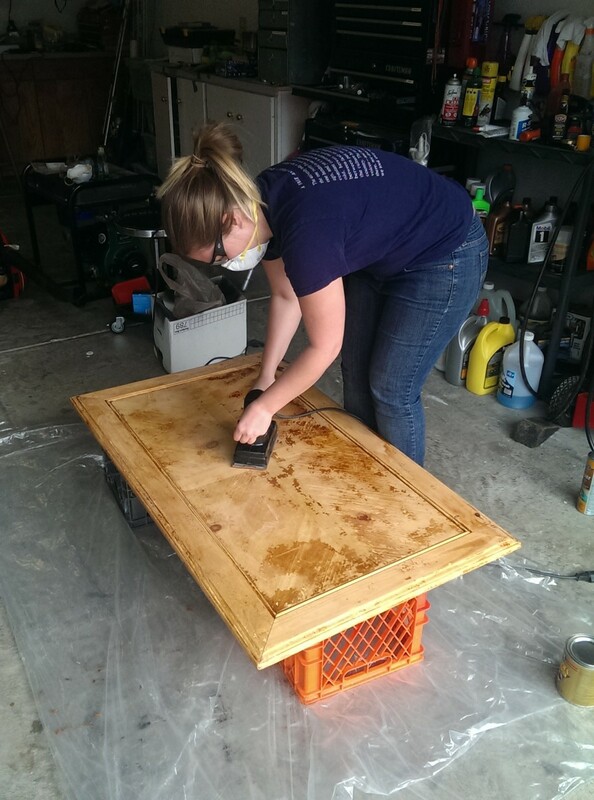 In my staining portion I chose to use the one-step type of wood stain, which is an oil based stain with polyurethane mixed in. The reason is because that was the only kind which had the exact color that I liked. If you don't find the color you want in that brand, or you want to do a different type of stain but don't know what to choose, I recommend going to Home Depot or Lowe's and taking a look at the different brands and kinds of stain. There are sample flip cards in the staining area so you can see what each stain they sell looks like. Make sure to talk to the paint department's representative and get their recommendations on products to use - they really know their stuff! Whatever stain you choose, keep in mind you will have to buy the polyurethane separately anyway. 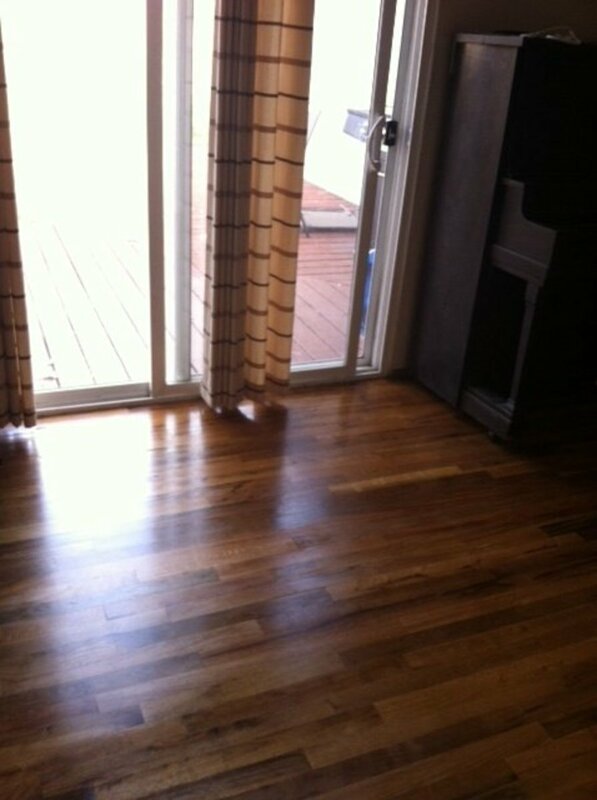 The polyurethane is the protective coating that keeps from damaging the stain and the exposed wood. It's also what gives your table that shine. I discovered while staining my table that having the polyurethane mixed in was nice, but it sure didn't hide any blemishes I had caused by uneven strokes. I could still see everything! So, no matter what you use, always finish with a polyurethane coat or two. Be safe and make sure to follow all of the safety precautions and disposal instructions on the supplies you will be using. The stripping, afterwash, conditioner, and stain are all flammable and need to be stored properly. The components you use to apply each also need to be disposed of properly. Follow the instructions on the back of the cans for proper disposal and safety instructions. Wood filler or wood putty like this, in case you have really big gouges to fill, and then you will also need a putty knife if you have to do this. Shoes that cover your feet, long pants, and a t-shirt that you don't care about. Know what you're getting yourself into when it comes to cost. Don't be blindsided! Step 1: Set Up the Work Area. 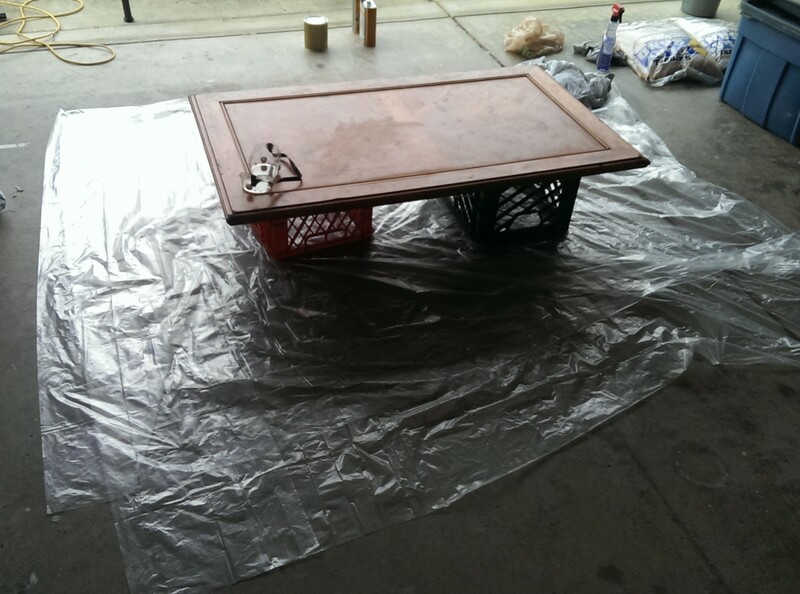 Put drop cloth down in the work area to catch any residue. If needed, have something to prop your table top up on and put it on top of the drop cloth. As you can see in the picture, I used milk crates. Have your safety gear within reach - breathing mask, safety goggles, and gloves. Keep pets and children away from the work site. Have a trash can nearby to dispose of used supplies and rags. Step 2: Take the Table Apart and Wipe Down All the Pieces. Wipe down any pieces you are using to remove any food or other type of residue. Step 3: Do Some Preliminary Sanding. Sand the detailing on your table. My coffee table has a lot of molding around the outside as you can see, so I wanted to make sure this was done well first. I folded up a piece of sand paper and stuck it in the crevices (which also helped clean all the gunk out before doing anything else). If your table has no detailed cracks or crevices you can skip this step. Stripper is dangerous to work with because it contains chemicals that are dangerous to breathe in and can burn your skin. I used Klean Strip Premium Stripper, which comes in an aerosol can. I find this type of stripper to be the most user-friendly. Spray from your arm’s length away (don’t hold the bottle close to you), but keep it about 6-8 inches away from the table top and spray in even strokes across the table. Once you have finished spraying, let it sit for 15-20 minutes. Step 5: Suit up and Scrape. Once the paint stripper has had time to set in, suit up in your safety gear once more. For this step you will need a plastic paint stripping tool, which looks like a mixture of a putty knife and a mini-shovel. 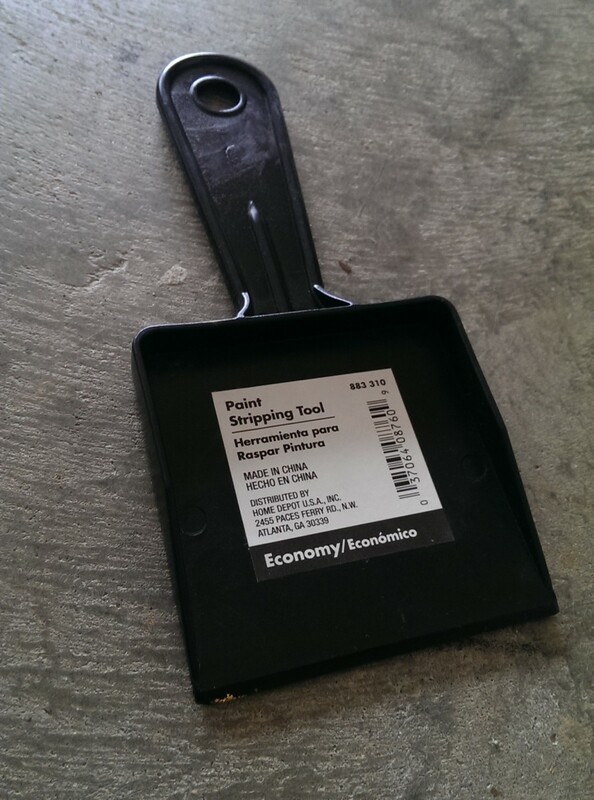 Check your stripping tool before you use it to make sure the scraping edge is smooth, with no bumps or bent edges. Using the stripping tool, firmly scrape along the wood and you will see the varnish come up very easily. If all of the varnish does not come off in the first scraping. Don’t worry, and don’t scrape too hard to get it all off. Just take off as much as you can without damaging the table. 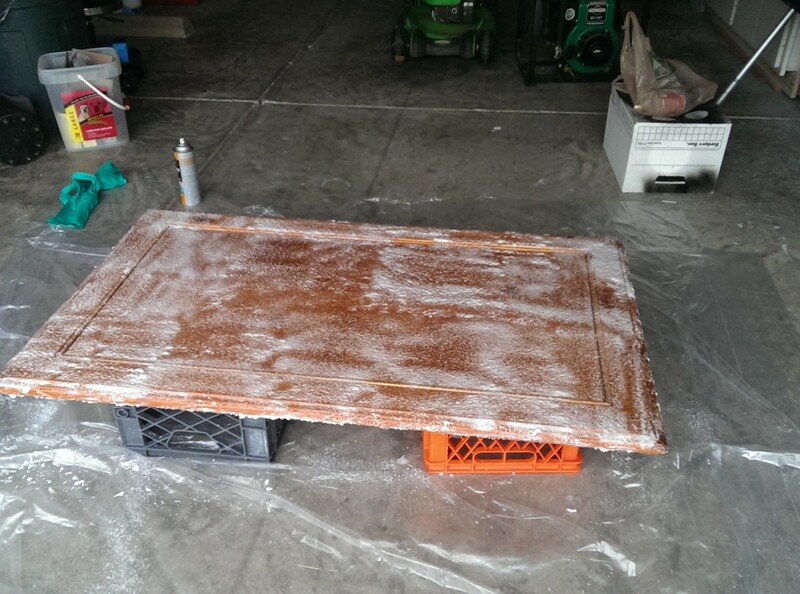 For really bad trouble spots, spray more paint stripper on when you are finished stripping the table and let it sit for a while more. Then come back and scrape the table until as much as you can get off is gone. 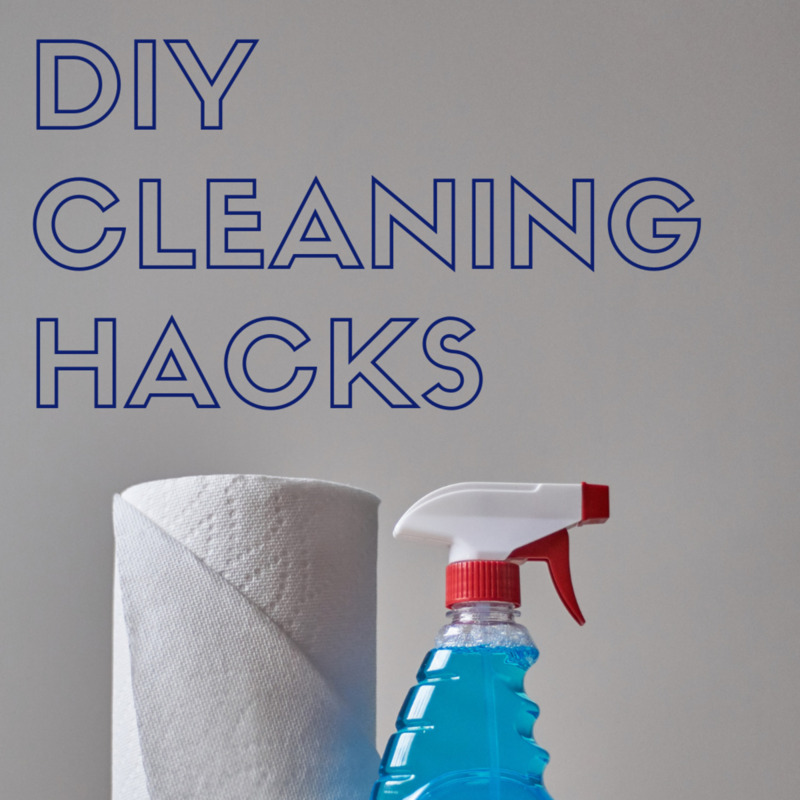 As you are scraping, make sure to pick up any clumps of old stain off your drop cloth and put them in the trash can so you don't step on them. I made the mistake of not doing it soon enough, and I stepped on a large piece of old stain and stripper. It melted the rubber off of my shoe, guys Seriously, make sure to clean up after yourself! 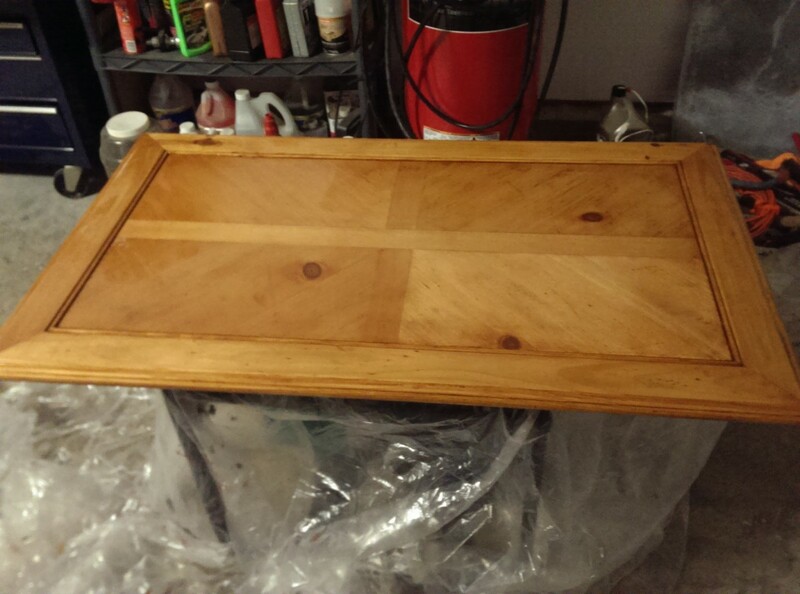 Once you have as much of the old stain/varnish off the table as you can, here comes the satisfying part where you get to take off most of the spots that are left over from the stripping. You will need what is called “after wash.” It is reminds me of industrial strength nail polish remover, and smells like it too. If you are not outside, I do recommend a mask for this, and you will need gloves while handling this stuff. I ended up using almost the entire thing no need to skimp. Pour the after wash in a metal container. Soak a clean white rag in the afterwash, and scrub away. This is the most labor intensive part and may take a long time, but it really makes your life easier, especially with detailed tables like mine. If your table does not have a lot of details and molding, you probably won’t need to use very much to get the rest of the stain off your table. If you have some serious trouble spots after scrubbing away with the after wash, don’t worry too much because sanding will come next, which will take away most of the really bad spots. Step 7: Wash the Table and Let It Dry. 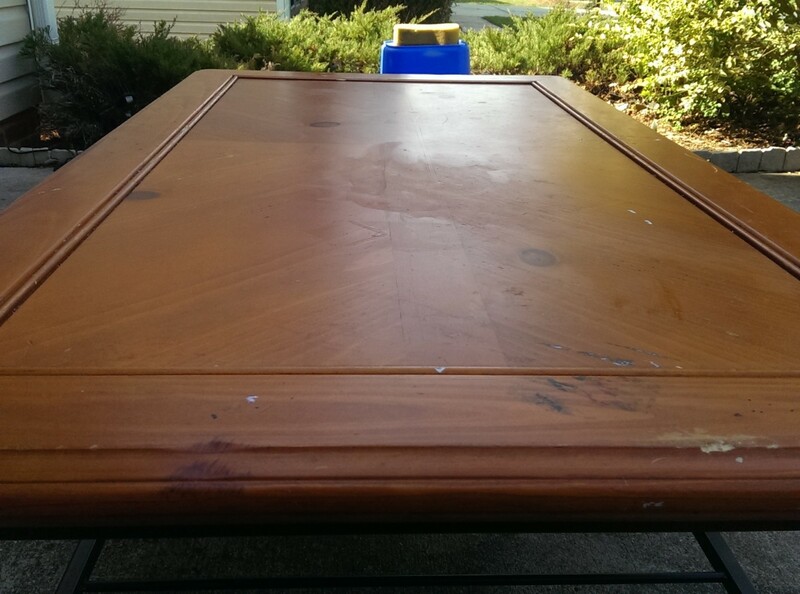 When you have finished with the afterwash, take your table outside and scrub it down with a scrub brush, dish soap, and water to clean off the left over residue from the old varnish. Dry it with a clean cloth and lay the wood out to dry for a couple hours. 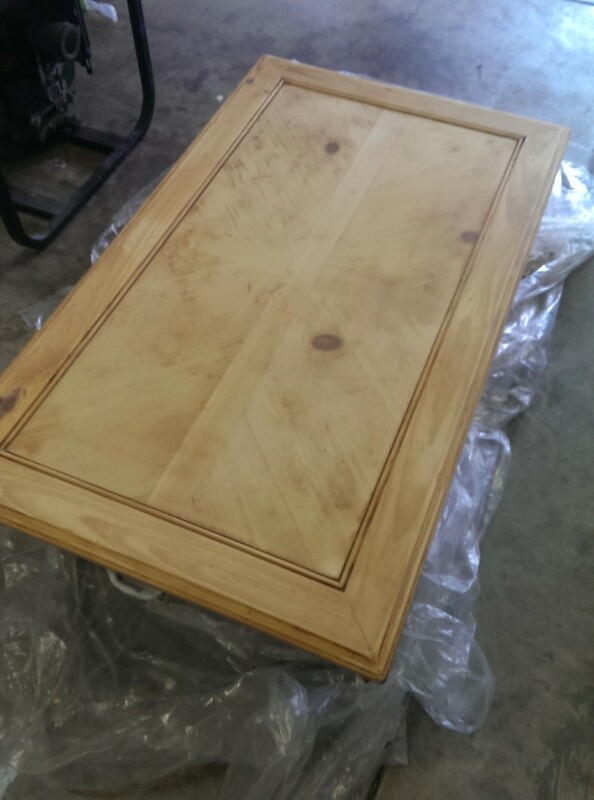 Once your wood is dry (we left it overnight and picked back up the next morning), you are ready to sand! Step 8: Sand the Wood. 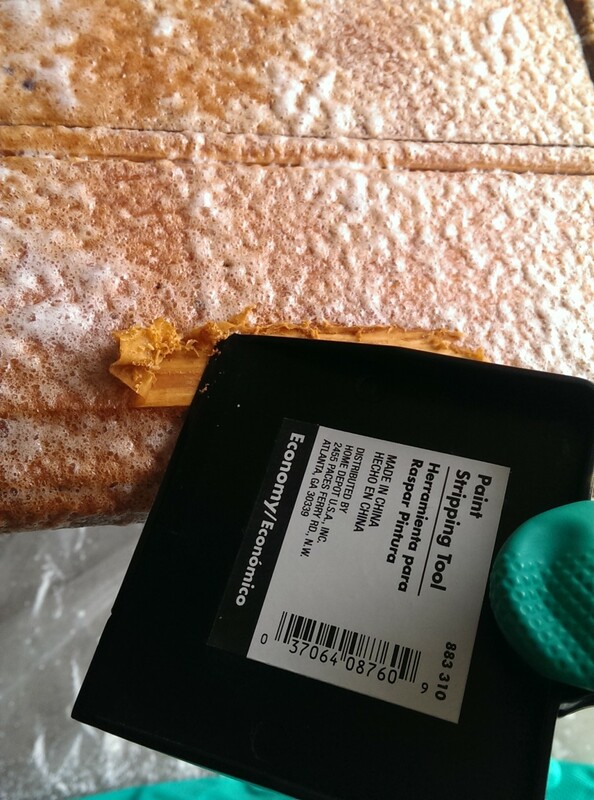 There are some things to remember about using sandpaper on wood if you want it to turn out smooth and spot-free. Sometimes it may be a guess and check for your specific coffee table to figure out what grit you should use. Here is a helpful guide on choosing your grit of sandpaper. Remember that the lower the grit of sandpaper, the rougher it is. You want to start sanding with a lower grit sand paper to get out any gouges or left over splotchiness from the old stain. I started with a 120 grit sand paper on a power sander, but realized pretty soon that wasn’t doing much to get the gouges out of my table. So I switched to 60 grit and using a hand sander which did a MUCH better job. Power sanders are great, but they can only do so much.With the detail on my table it ended up being better to sand the whole thing by hand. Go in the direction of the grain of the wood. The grain of the wood will be in the direction that the little lines and curves in the wood are going (refer to the picture on the right for reference). If you go against the grain your table will have odd looking scratch marks all over it that can be difficult to fix later. DO NOT SKIP THIS STEP: After you are done with the lower grit sand paper and have gotten the major blemishes out, you want to switch to a higher grit sand paper to make the surface smoother, and then go up another level after that. I went up to 100 grit and finished with 150 grit. 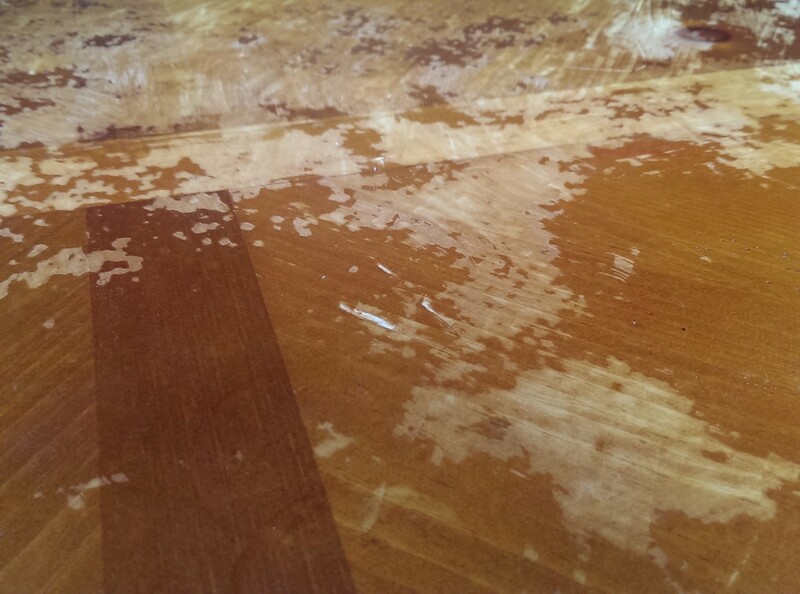 If you only use the low grit sand paper, your table is essentially scratched and not ready for the stain. 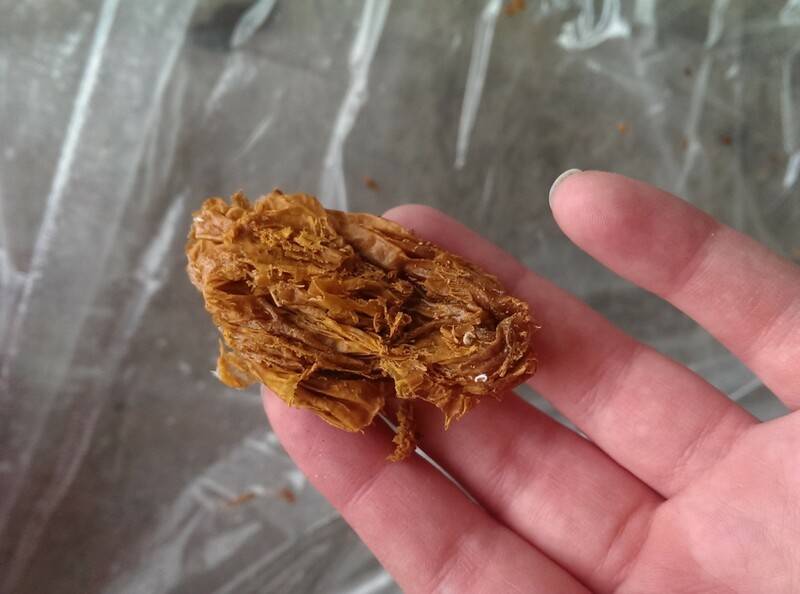 It will take stain unevenly and cause problems in the future steps. Step 9: Wipe Down the Table to Prepare for Conditioning. I used pressurized air to get the sawdust out of the cracks of the table first, which isn’t necessary if your table doesn’t have any details like mine does. Wipe the table down with a clean rag as well to pick up any other particles. After you have wiped down your table, now is time to condition the wood. Step 10: Condition the Wood. Most woods used for furniture are soft woods like pine. There are some hardwoods that are porous as well. Because of the softness of woods like these, it is highly recommended to condition your wood before you stain to make sure the wood takes the stain evenly. Soak the end of a clean white rag (or piece of t-shirt like I did) in the wood conditioner. 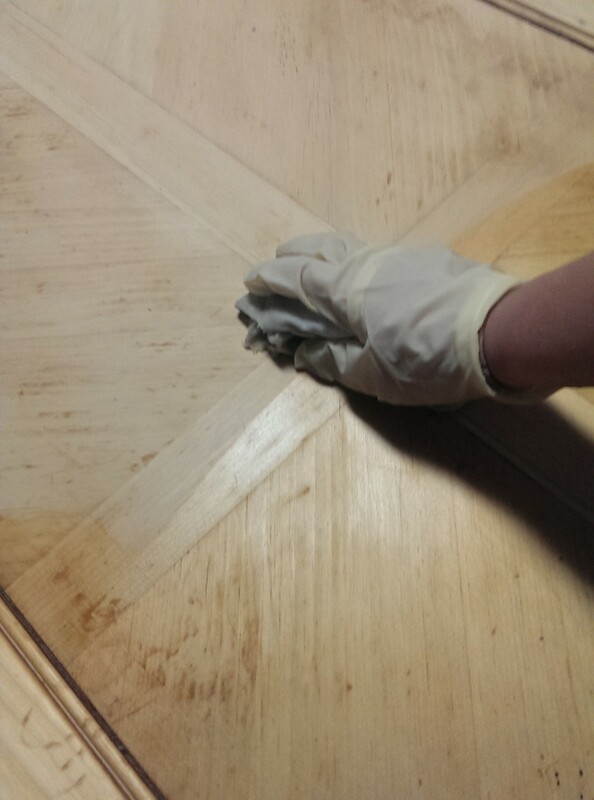 Gently rub into all of the wood that will be exposed and stained. This will need about 20 minutes to dry. 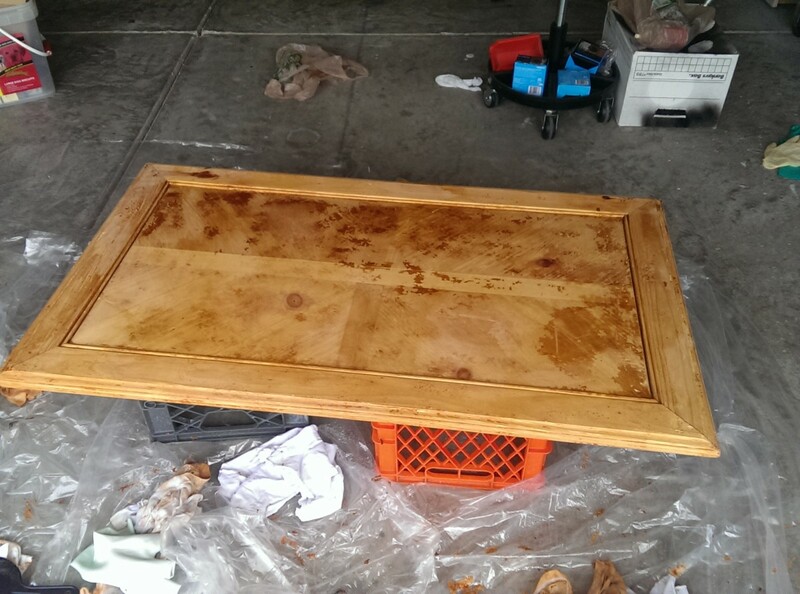 Step 11: Apply the First Layer of Stain. I used a foam brush as opposed to a bristle brush, because it helps keep the color a little more even, especially if you have an unsteady hand like I do. It is important to remember to go with the grain of the wood when staining. The grain of the wood will be in the direction that the little lines and curves in the wood are going (refer to the picture on the right for reference). If you stain against the grain, your stain lines will be noticeable and it will look really bad when it’s dry. 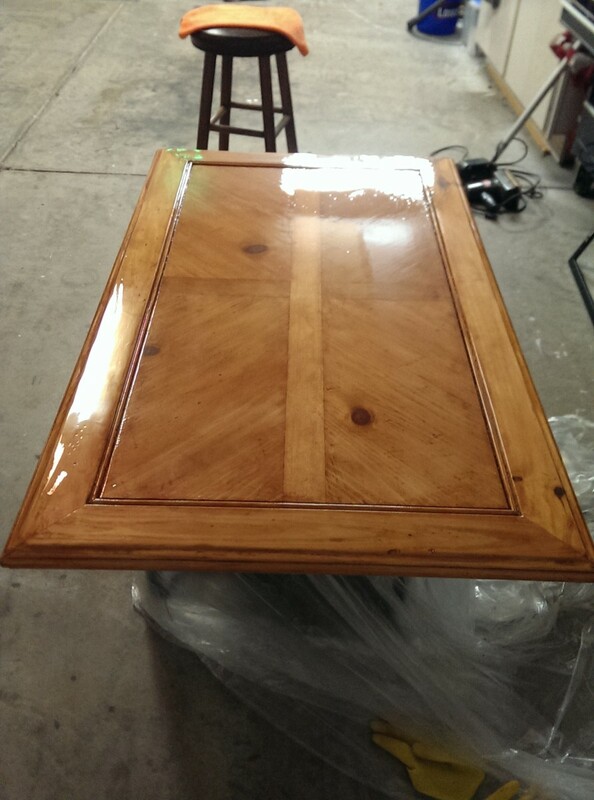 Apply the stain evenly and gently across the table and going with the grain of each section. You don’t want to have a super thin layer of stain, but you also don’t want extremely thick because then it will take way too long to dry. DO NOT SKIP THIS STEP. Once the stain is applied, let it dry completely before putting on your next layer. The back of the can will say 6 hours, but I recommend much longer to be safe. I let mine dry for two days before I came back to it. You may be able to start earlier than that, but if the stain feels tacky whatsoever when you check it then do not proceed to the next layer of stain. You may think you’ve done it wrong when you look at the table after it’s dry because some parts might be shiny from the stain and some parts might not be. Don’t worry, you didn’t do anything wrong! That’s why you do multiple layers of stain, which will even out the shininess. 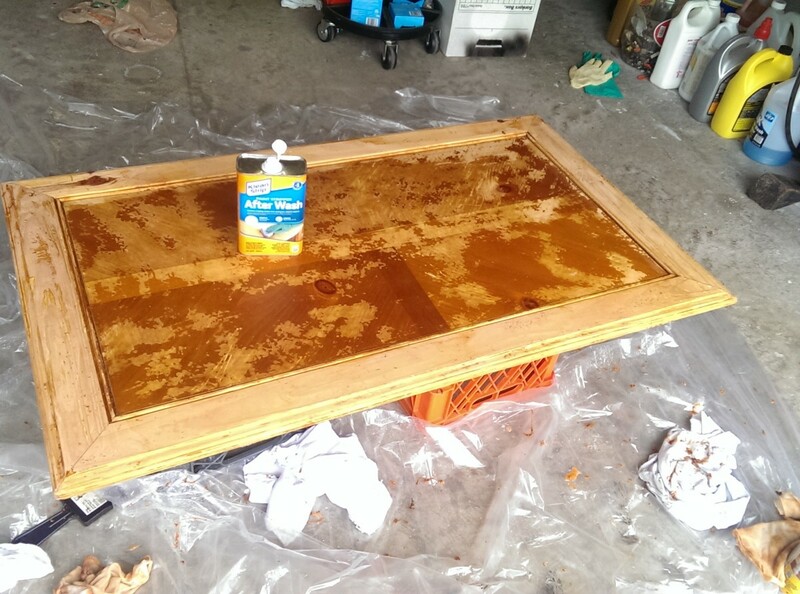 Step 12: Apply Your Second Layer of Stain. The darker your color, the more you have to pay attention to make sure your strokes match the wood grain. This will be the case more so with lighter stains in the third step, but you will still want to be careful here as well to make sure your stain isn’t splotchy from the paint brush. 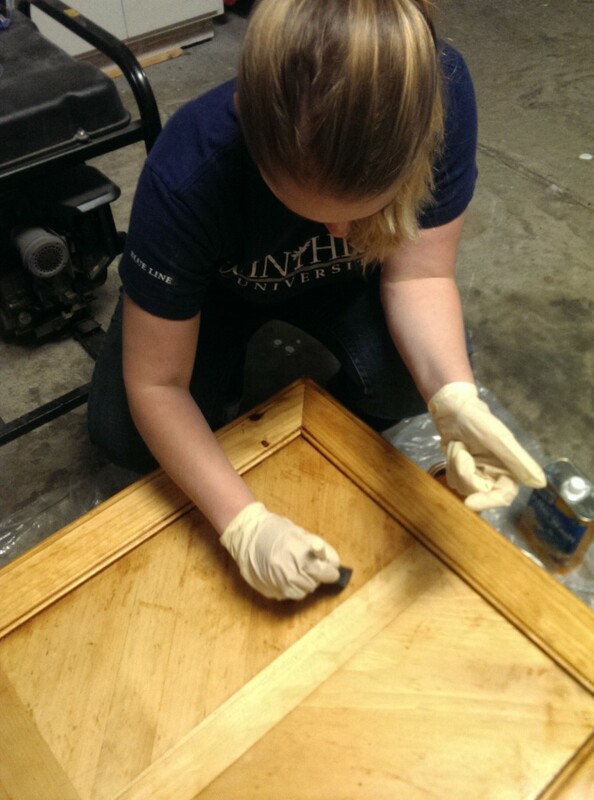 Follow the same steps as the first layer of stain, keeping special care to stay with the grain of the wood. Let it dry. This time I also left my table for two days to dry, not by choice this time, but because I had to work. However, it worked out perfectly because it was completely dry by the next time I was able to work on it again. 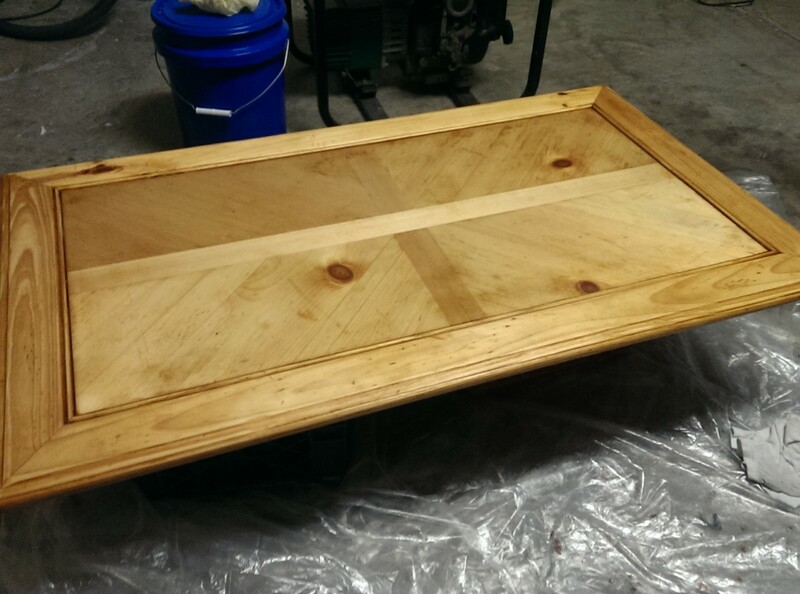 Step 13: Lightly Sand Over the Stain. If you feel it before sanding, you will notice on your table that it might feel a little bumpy or have little spots that seem to catch on your hand as you run it over the area. That’s completely normal, and that’s where the sanding comes in. For this step you will need a very high grit of sand paper and a non-electric hand sander, because you are not completely sanding the table down. You are just smoothing it out for the next layer of stain. I used 400 grit sandpaper. Very lightly sand the table down. DO NOT press hard as you don’t want to remove the stain. It will almost feel like you’re not actually getting anything done. But to get an idea of what the high grit is doing, run your hand across the part of the wood you are sanding and feel how bumpy it is. Then take your sand paper and run it over the area very lightly, going with the grain of the wood. Do this a few times and feel it again. You will feel a noticeable difference and smoothness to the wood. Do this across the entire table until all exposed areas have been sanded. Step 14: Wipe Down the Table. Again here, I used compressed air to get the stuff out of the cracks, and a white t-shirt rag to wipe down the rest of the table. Step 15: Apply the Third Coat of Stain (if needed). Not all tables will need a third coat of stain. If you have done two coats of stain and lightly sanded down, and you like the look of your table, stop here and proceed to the polyurethane step. But if you're like me and the stain color wasn't quite dark enough and there were still some dull spots, proceed to apply a third coat. By this point you will need to be super careful that your stain goes with the grain of the wood and that you are applying it evenly. The darker you go with a light stain, the more noticeable the mistakes will be when it is dry. Be very careful in this step and use a light hand when applying. Be mindful that you don’t have a lot of stain seeping into the cracks and puddling up in the molding. You will also need to work relatively quickly during the step, as I found out for the size of my table that for some reason it seemed the stain was drying a lot quicker on the third layer so it was making it harder to go back and correct mistakes later. Make sure you are still applying everything evenly and that you work quickly enough that the stain doesn’t start drying while you are still trying to smooth out a spot on the table. Let the stain completely dry (I left it overnight) before doing the final sanding, polyurethane coating, and putting the table back together. Step 16: Do the Final Sanding. For this step you definitely will want to again use a super high grit sand paper (I used 400 again). 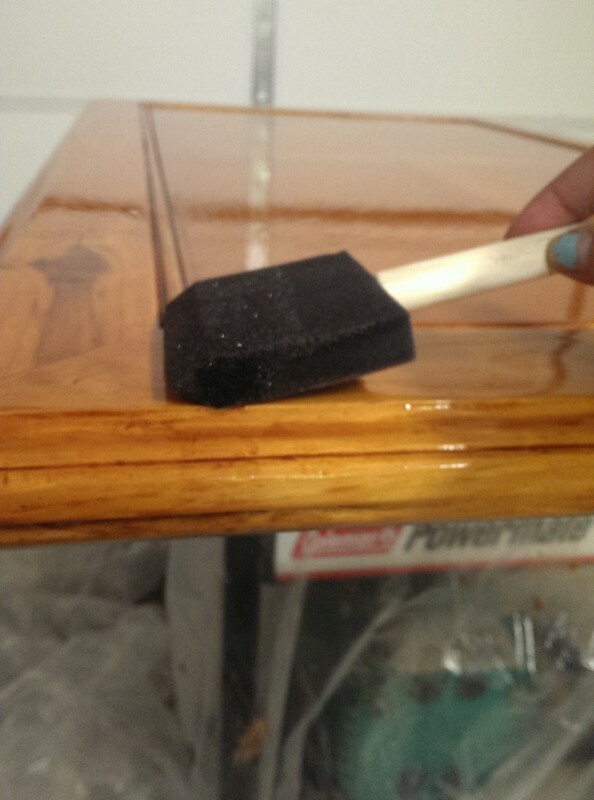 Lightly sand away any bumps or splotches that need to be evened out from the third coat of stain. Again you don’t want to press too hard and take away all of the work you just did. 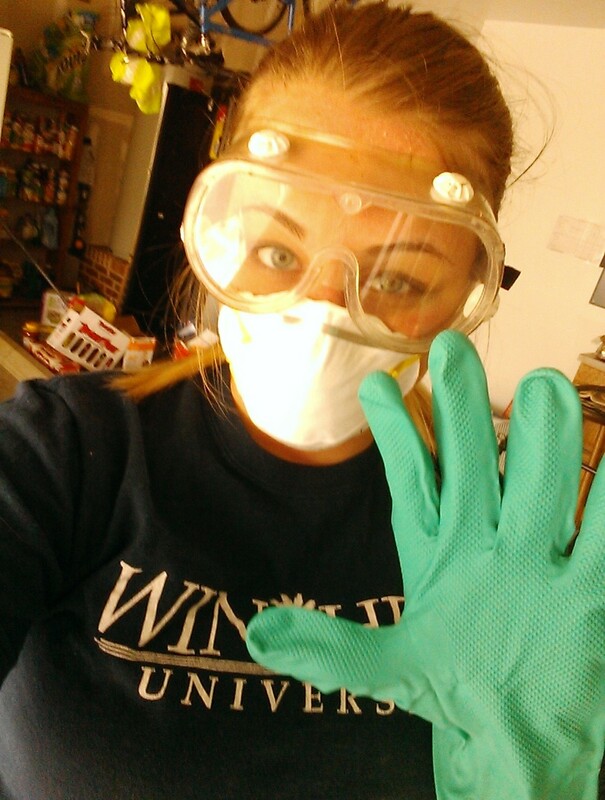 Wipe down the table after you are finished with the sanding. This step is the easiest. 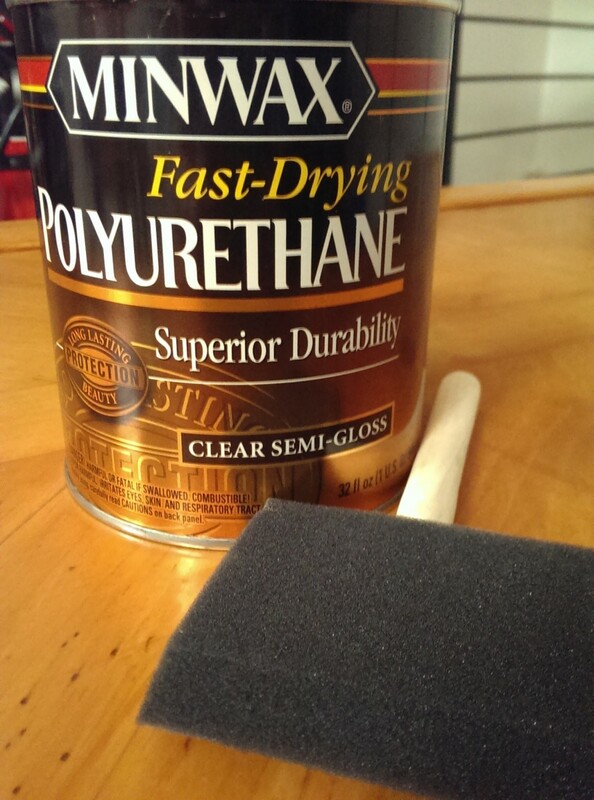 Using the widest foam brush you have, apply a very thin layer of polyurethane to the table. What I discovered with the polyurethane is that you don't really need to go with the grain of the wood, because its whole purpose is to make everything smooth. This was great news for me because my table has a lot of wood grains going in different directions that were difficult to keep even, so I have some blotchy spots from my third coat of stain around the edges of each square. Be mindful that with a foam brush you have to be precise or bubbles will form in the polyurethane. While doing this I learned that the best way to prevent bubbles is to lay the brush relatively flat onto the surface and gently drag it along in one stroke along the length of the table. Let the polyurethane dry at least 3 hours. If it is still tacky, do not do anything with it and let it keep drying until it is completely hardened. If a second coat is needed on your table, lightly sand over this coat to remove any rough spots and apply a second coat. 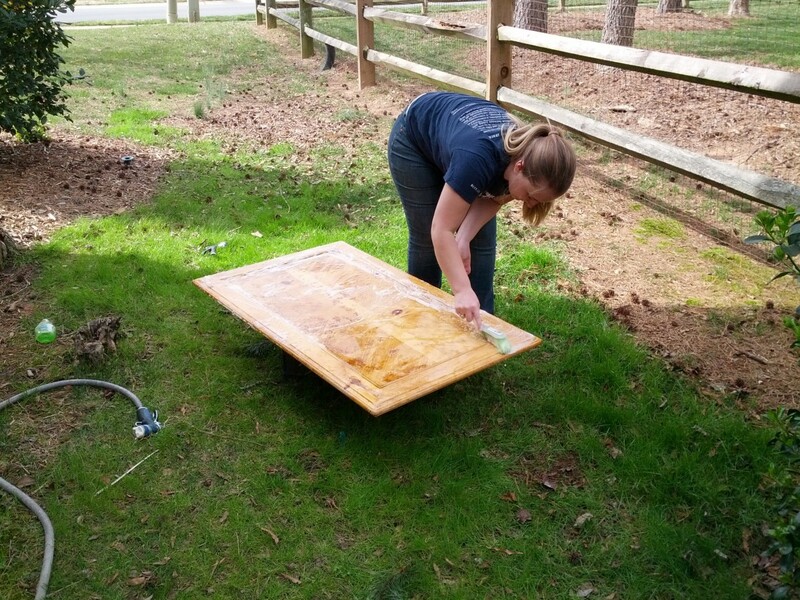 Let dry completely before putting your table back together. Step 17: Safely Dispose of or Store ALL of the Used Supplies. Your foam paintbrushes, unless you really want to try to clean them out. This isreally difficult to do with oil-based stains, and foam brushes are disposable so I recommend just throwing them out. If you do clean them don't clean them in a sink where you handle food. Best to do in a bucket with a garden hose outside. Empty or unused portions of your chemicals. Throw the empty cans away following the instructions for disposal on the back of the can. If you have leftovers you are saving, store in a cool place away from anything that can cause it to catch fire, such as furnaces, heat pumps, engines, matches, or other sources of flame. Your old rags (you won't really be able to use them for anything else). 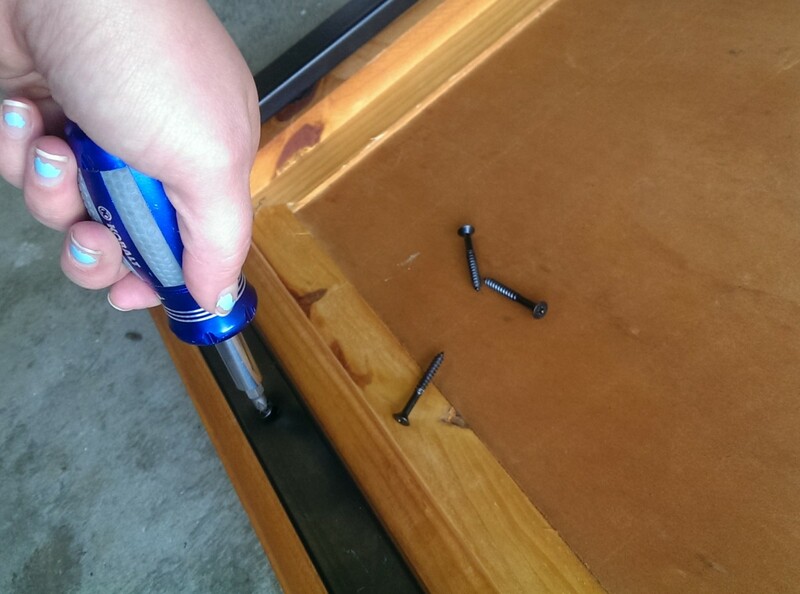 Step 18: Put Your Table Back Together! Congratulations! 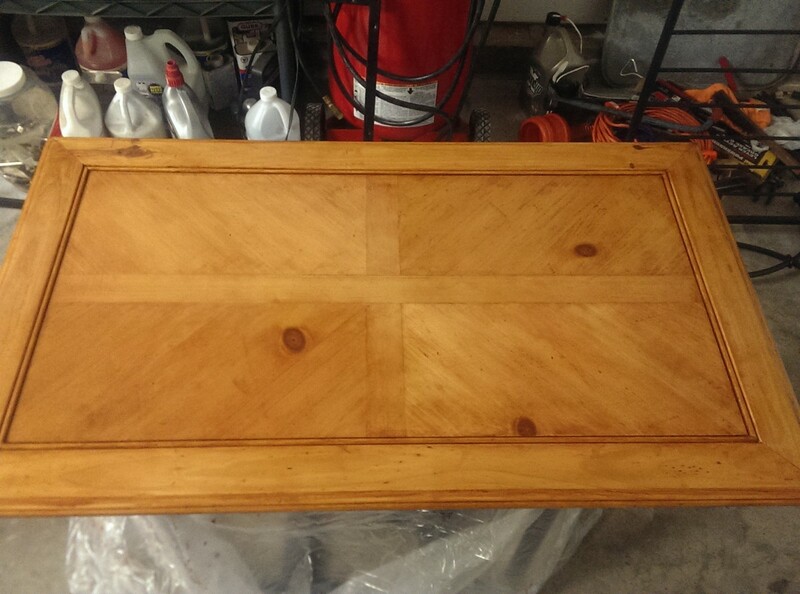 You have officially stripped, sanded, and stained your own table! You should feel very accomplished – this is a difficult and time consuming DIY to do if you’ve never done it before yourself. Put your table back together, place it back in its intended spot, and admire your handiwork – you did a great job! I did not - I just used a foam brush that had an angled tip so that I could be precise around the edges of each panel. Keep in mind too that you are using very thin layers of stain at a time, so if there does end up being a little bit of visible overlap, you can sand it and smooth it until it blends in. If you tape it, I would be concerned about stain pooling on the edge of the tape and becoming too concentrated on the lines where the tape was. Don't let a pattern scare you - staining is definitely not as scary as it looks, even on panels! 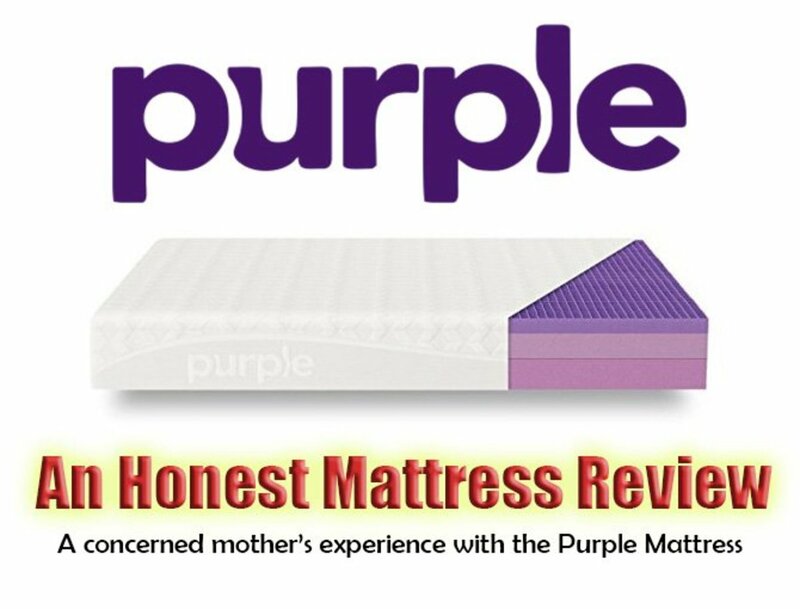 Purple Mattress Review: Is the Purple Powder Toxic? Thank you for all the helpful information. Will be putting this information to use. Thanks again. Hi Victoria. Absolutely first class hub. Brilliant advice and a great job. Well done. Woah! Very informative step by step guide. The actual product seems very outstanding. Two thumbs up for all the details dedicated to keep the chemicals safely from contaminating the clothing. A well-deserved HOTD! Congratulations on your HotD. This is actually information I have been recently looking for so your article was very timely and your instructions are easy to follow. Thank you! This project turned out really well. It's been quite a while since I took on a job with this much work but yours seems to have been worth the effort. The table is beautiful. Great instructions and step by step photos here. I'm glad you emphasized the need for respirators and protection against breathing the fumes. Congratulations on your award of HOTD. Awesome and very useful hub...I liked it " a lot"! Good illustration of the process. Makes it easy for us to follow. Wow! Writing this hub must have taken as many hours as fixing up your table did. What an impressive effort ... on both counts. Loved the photos and all your helpful tips. Congratulations on HOTD. Great Hub! Very useful and well written. I like how you outline each step thoroughly. As someone who had never done DIY, this was very helpful. You obviously love what you were doing, and it showed in the writing. Good job, and Good luck here on HP! This is an excellent hub and a fantastic resource for anyone who wants to improve the look of a coffee table! The list of instructions and safety precautions is extremely useful. Congratulations on Hub of the Day. You certainly deserve this honour! Wow, what a project! Good for you for doing your research and making it happen. And you did an excellent job of explaining how to do this project to the rest of us. Beautiful job. Excellent tutorial! Congrats on Hub of the Day! Well deserving of an excellent HOTD, Tori. Congratulations! 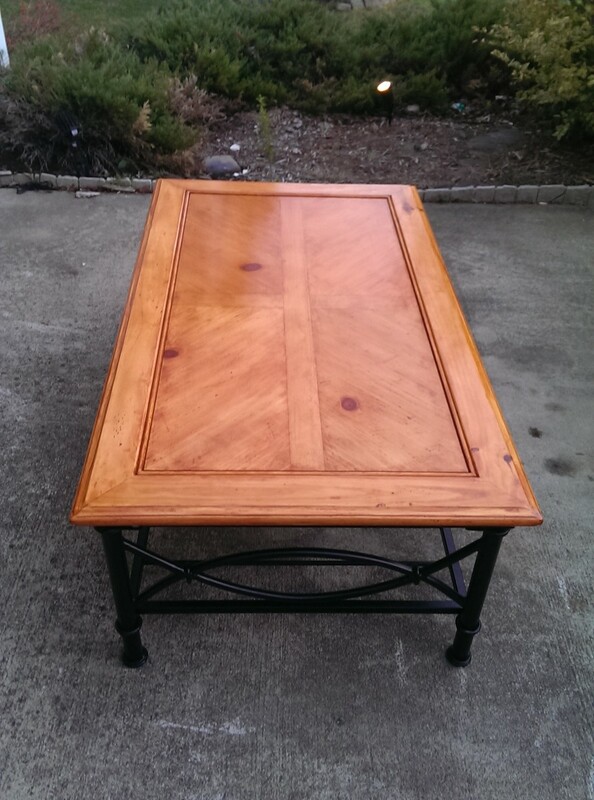 I have refinished tables and other furniture and have always been amazed at what the right products, tools, and lot of elbow grease can do. 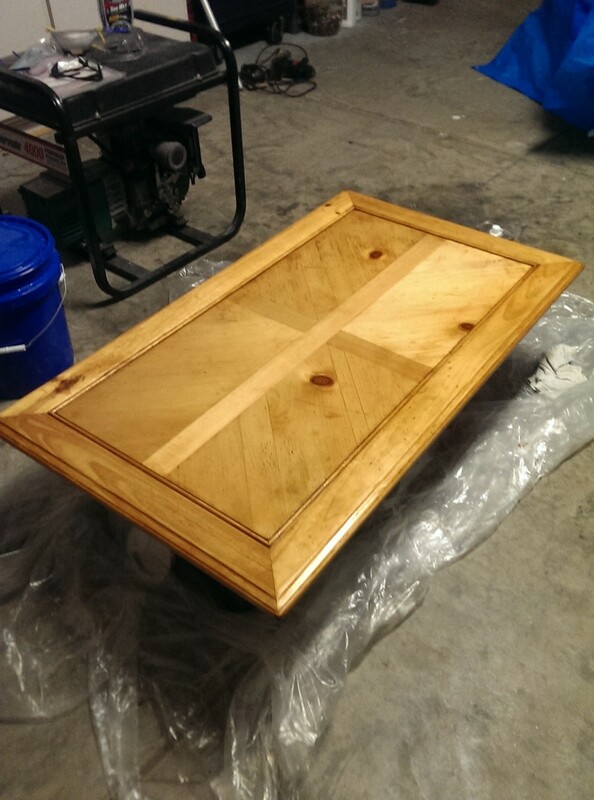 You table turned out beautiful. This is one of the best DIY instructions articles it has been my pleasure to read. I always get one of my nephews to redo, paint and hammer anything. By your instructions I might even try it sometime in the New Year 2015. Have a wonderful New Year. And, your finished table was beautiful. I voted up ++ and I will share it with my Twitter friends and put it on my Repin board. Congratulations on earning Hub of the Day with this terrific article. You are to be commended for the detail, the photos and especially the safety precautions you provide because the chemicals used in the process are highly flammable. I once had a neighbor who started a house fire from improperly disposing of rags soaked in turpentine. Enjoyed and voted up! I love this! 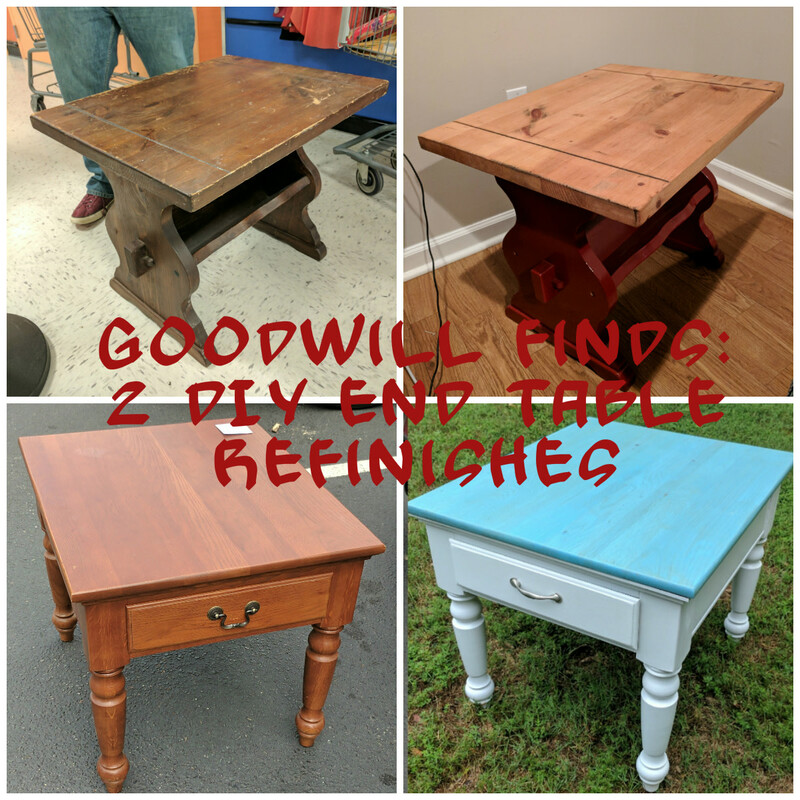 You've covered everything we need to know about refinishing furniture (I'm going to use the tips on some non-table things that need a fresh look). Just shared this on Facebook, so I'll have it bookmarked. Congrats on the HOTD - so deserved! Tori - what a great and informative hub! I'm going to save this and refer to it when I finally get my nerve up to refinish some furniture. I have a few things that could use a fresh look, but I don't even know where to start, how to do it, or what to purchase. You've covered all of that, and even included pictures! Great job - congratulations on your HOTD - you deserve it! Great Hub so much detail it must have taken you a life-time to get this all done! This was a very detailed, thorough and well done hub. Congratulations on your HOTD. Great tutorial and congrats on HOTD! Well written hub! Impressive! Beautiful re-do. Congrats on Hub of the Day. What an excellent tutorial! The pictures are great and really do complete the story. I particularly appreciated the supply list with prices. 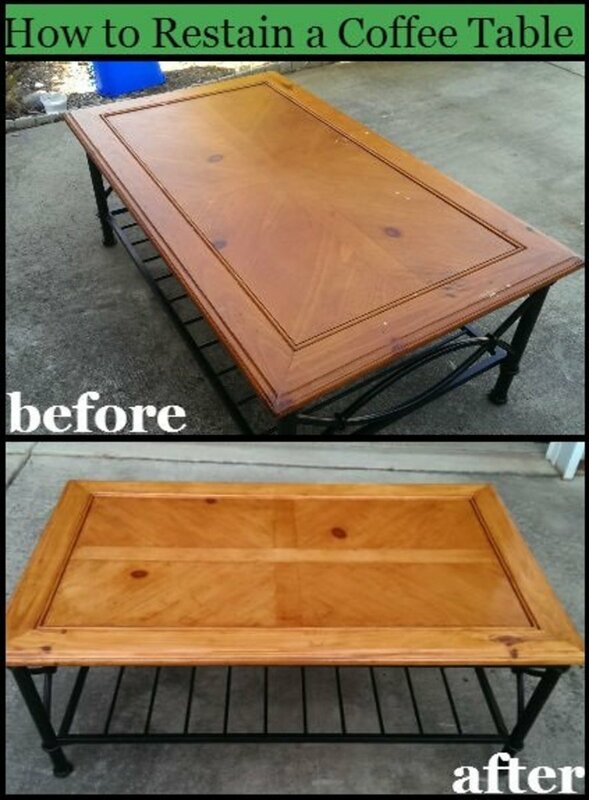 Your before and after is impressive - what a beautiful table! Congratulations on well-deserved Hub of the Day honors! Very useful tutorial and such a beautiful job on the table. Congratulations on your Hub of the Day award for this post that you obviously worked hard to prepare for and then write. This is fantastic, especially when it is based on the first-hand experience of someone who is doing it for the first time! You have given such clear and detailed instructions, and made a difficult job easier to complete. A well-researched and complete DIY compilation, as you have to refer to several websites before this. I also like your incorporation of the health and safety measures for doing this job. Congrats on Hub of the Day! Thank you!!! I hope it works out for you!! :) I have another table I'm refinishing too since I finished this one - it will be good to have it to reference! So glad to have this guide! We're just getting ready to refinish a table. I hope our finished product looks as lovely as yours. Hi fpherj48, Thank you very much for your comment!! I hope your staircase project goes well for you, and I'm glad my hub can be of assistance! If you have any questions, let me know. The staircase is a big project - I would love to know how it turns out when you are done...send pictures!! :) I'm sure it will look great! victoria....First of all, "Welcome to Hubpages." By the looks of things, your success here is 100% certain. You have started out with a BANG! Good for you. This hub is invaluable....and for me, quite timely. I am about to take on the task of refinishing a wooden staircase (of 13 steps). I've done a little of this sort of work, but I am very grateful for your wonderful tutorial! Thank you for sharing this. I have several couches that need reupholstering, hmm. I'll keep an eye out for your hub. Very nice tutorial and good job on the table, looks great!